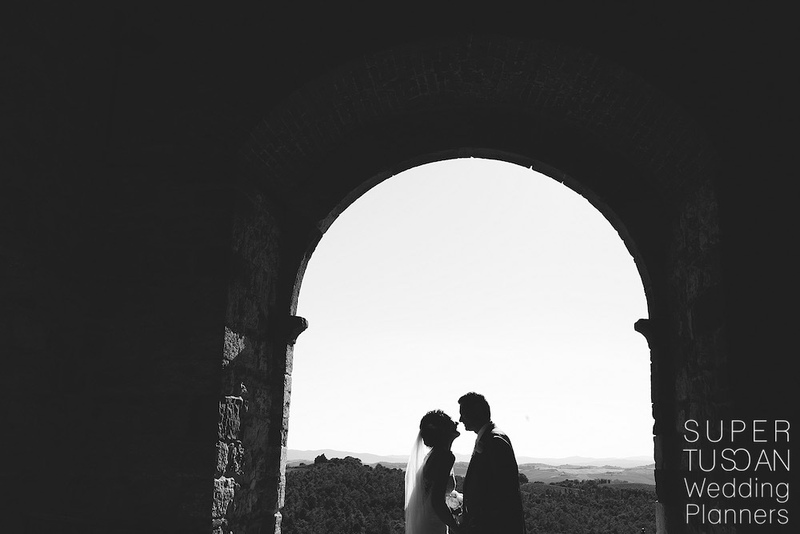 Outdoor Tuscan wedding in Chianti to celebrate an Italian-French love! 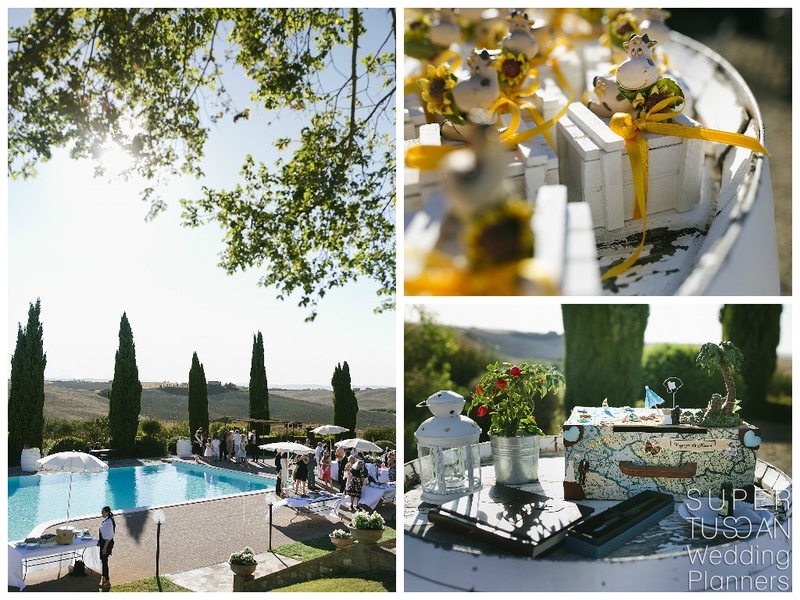 An Outdoor Tuscan Wedding with guests from all around the world! This is the wedding of Bianca & Loïc, that brought together all Bianca’s sisters who live around the world. Their family originated in Sicily and they chose to go live abroad, searching for a better future and better opportunities for their lives and careers. 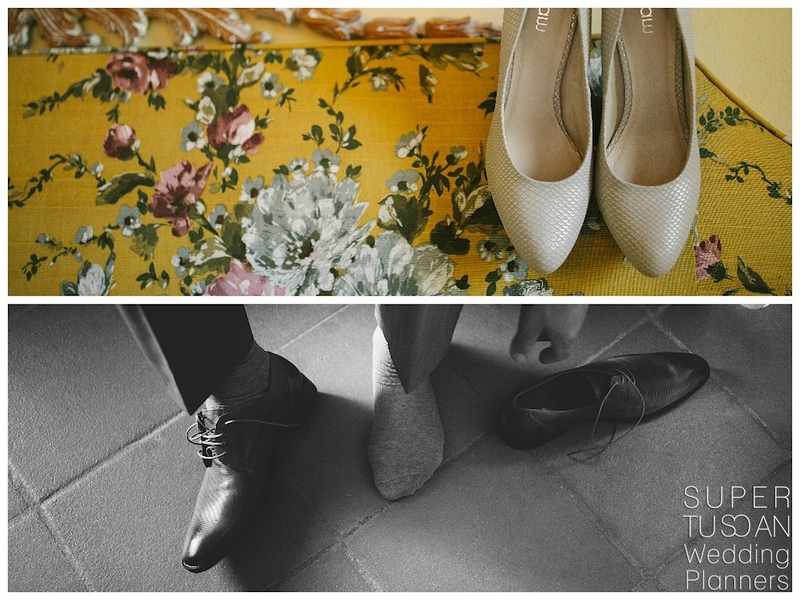 A difficult change that was the first step for this wedding. Is in France that Bianca met the love of her life, Loïc. Also, their Outdoor Tuscan Wedding has been an opportunity. An opportunity for all families and friends that live so scattered across the world, to come together. 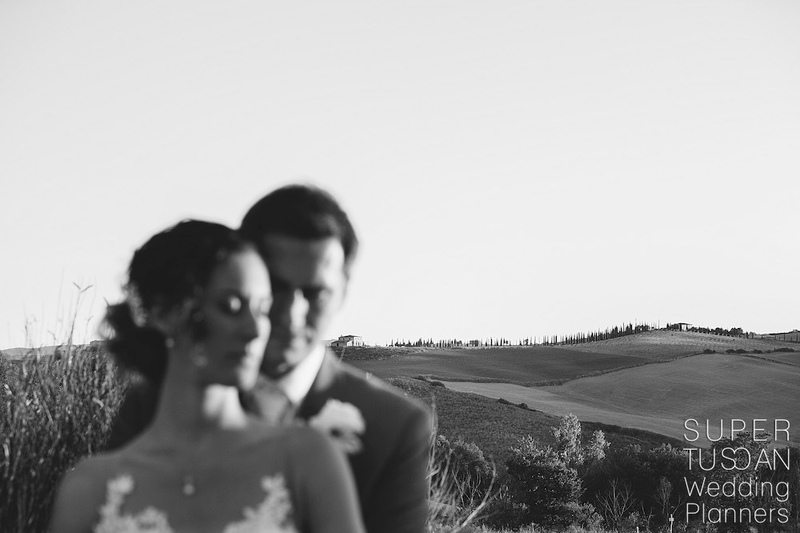 Bianca with her French husband chose Tuscany, as symbol of Italy. 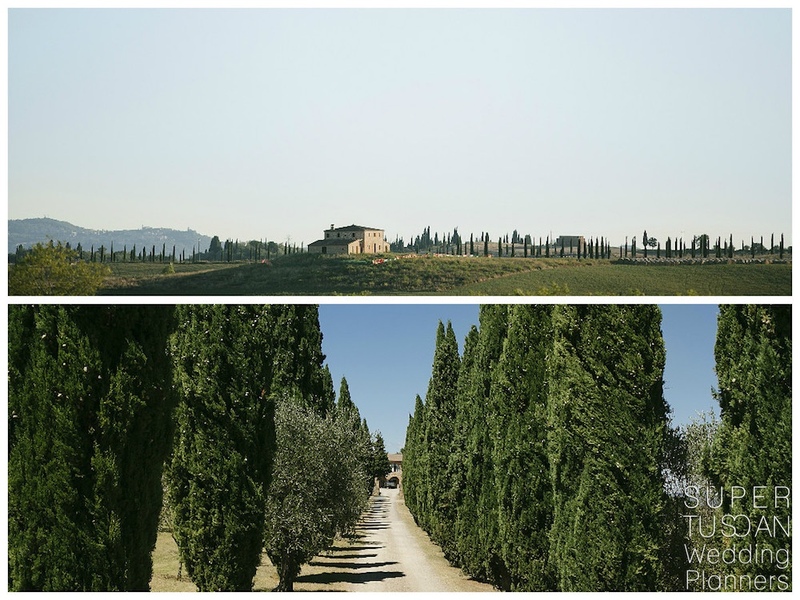 In addition, they introduced guests not only the beauty of Chianti, but also to a star chef, to a stunning villa surrounded by green and to the local DOC wine among the best in Tuscany. 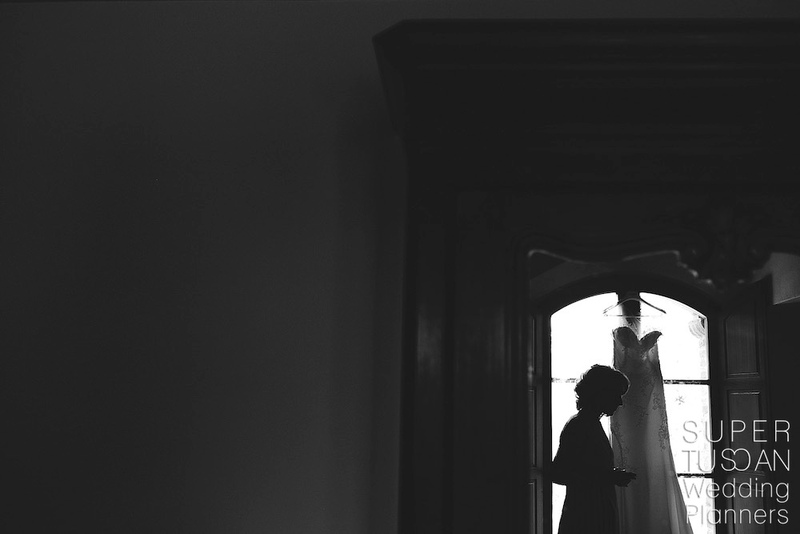 They chose to get married in a small church in a nearby village. 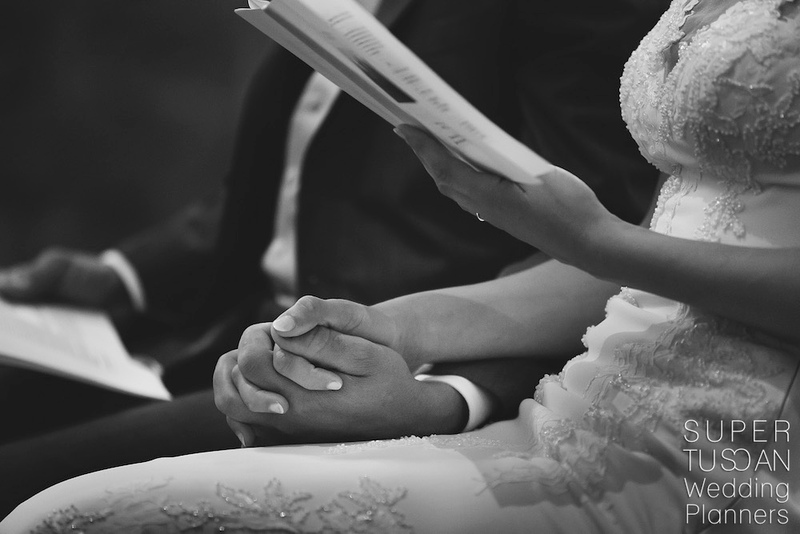 The goal of the couple has always been to keep and maintain simplicity. And everything has been studied in detail to keep things simple and authentic just like the principle of family, that in Italy is so important. 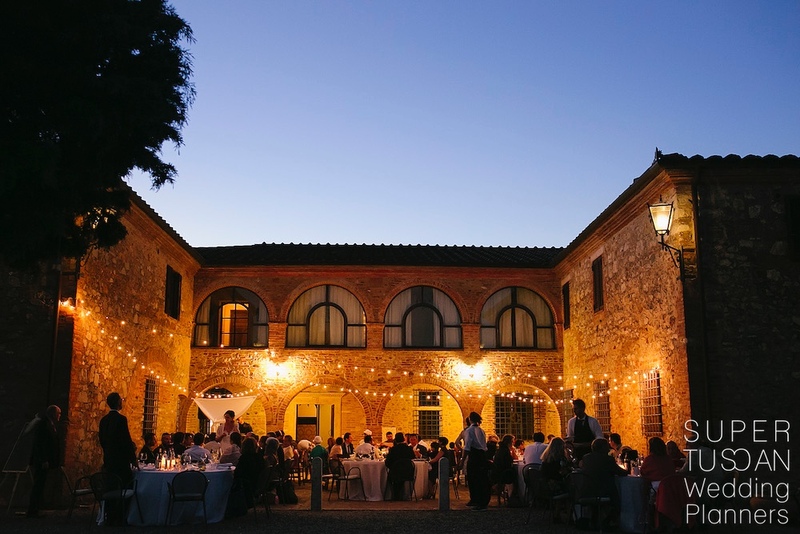 To celebrate their love in a Typical Italian and Tuscan way, the couple decided to have a peculiar rehearsal dinner, the night before the wedding. All the guests had dinner at the Porcini Mushroom Festival that takes place every year in Cortona (AR). It is a typical gastronomic event not to be missed which takes place for a whole weekend where you can enjoy delicious dishes made with mushrooms picked in the mountains of the area. This rehearsal dinner took place outdoors in the gazebo set up in a park, accompanied by good music and among hundreds of other regular visitors of the Festival. The day after, the wedding gathered everyone around Bianca & Loïc! 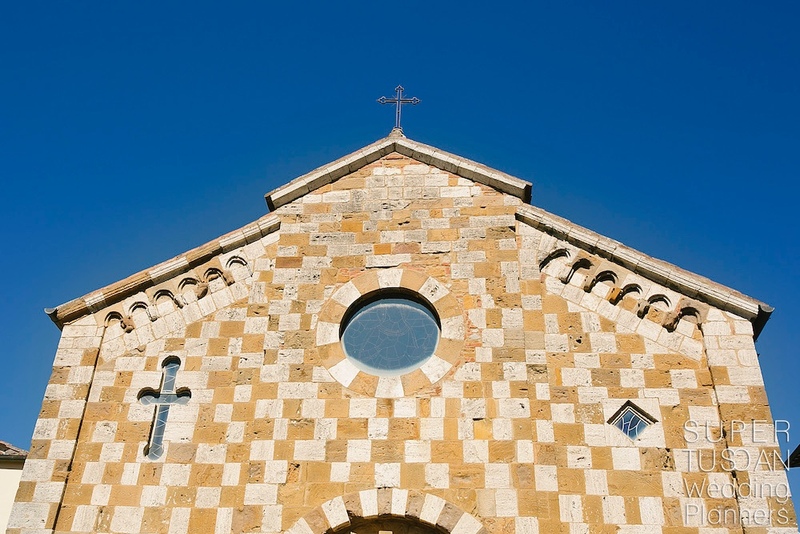 They had a Catholic classical Ceremony, in an ancient small church. 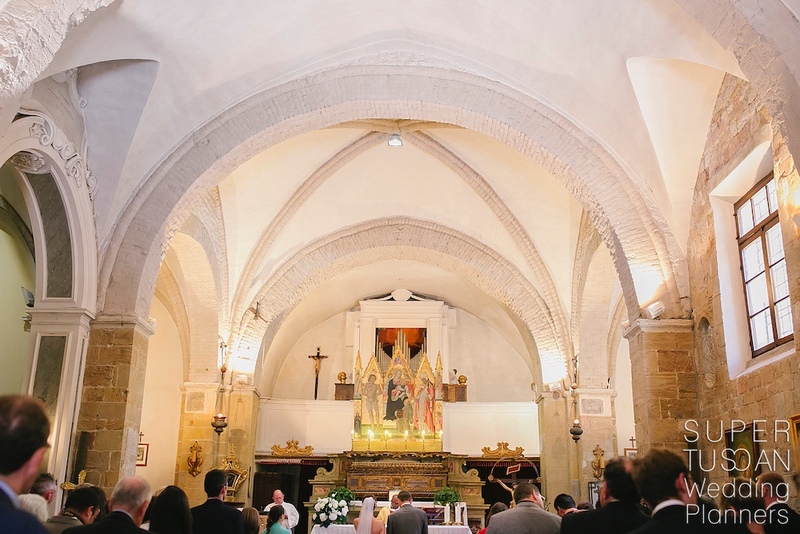 The ceremony was designed for them in French and Italian in the small village of Trequanda. After the ceremony, it was time to go back to the villa! 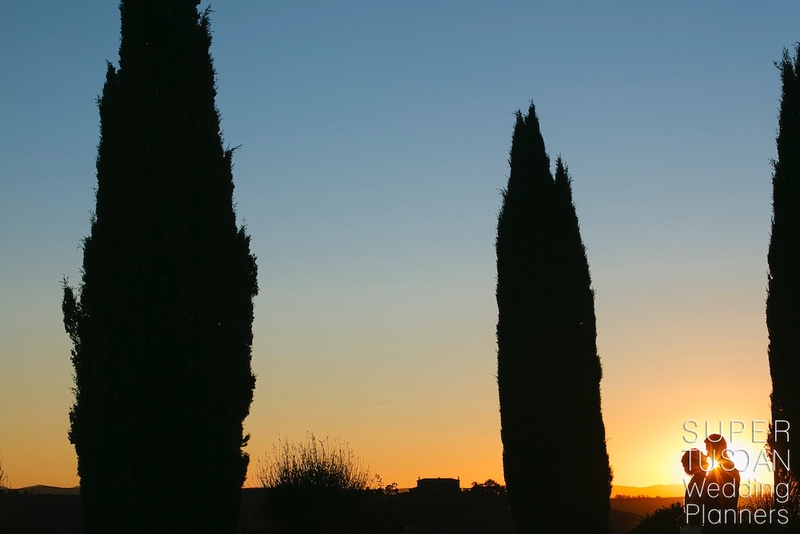 A drink and typical tuscan aperitif food accompanied the joy of the guests and there, into the countryside, by the pool with fresh air, Bianca & Loïc smiled and sensed all the family and friends’ love. And enjoyed an amazing Tuscan sunset! Dinner was in the courtyard with fairy lights to create atmosphere. Later, during dinner, a lot of surprises came. Family was celebrated with videos of Bride and Groom. Some pictures of their childhood, of their special moments before they met and together as well, touched everybody’s hearts . 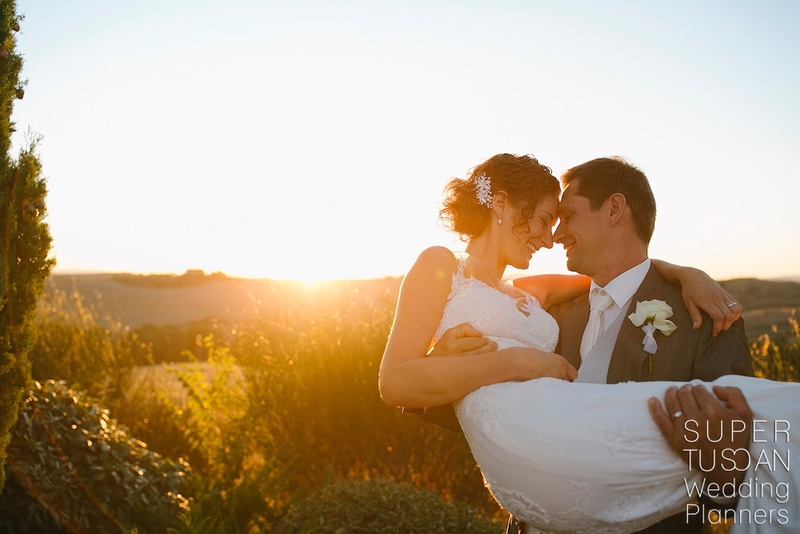 It was a great way to join past and present in the day that started Bianca & Loic’s future as husband and wife. Finally, to end this day of celebration, Bianca and Loïc have opted for a fruit cake. 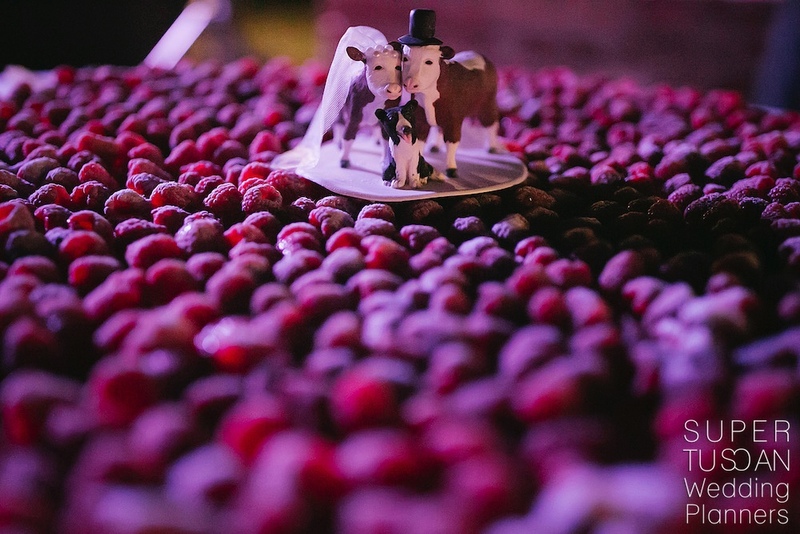 They chose a lovely couple of cows as topping for the cake and as wedding favor for guests. And after the cutting of the cake, everyone danced by the pool to end the day with the same joy it had started with! 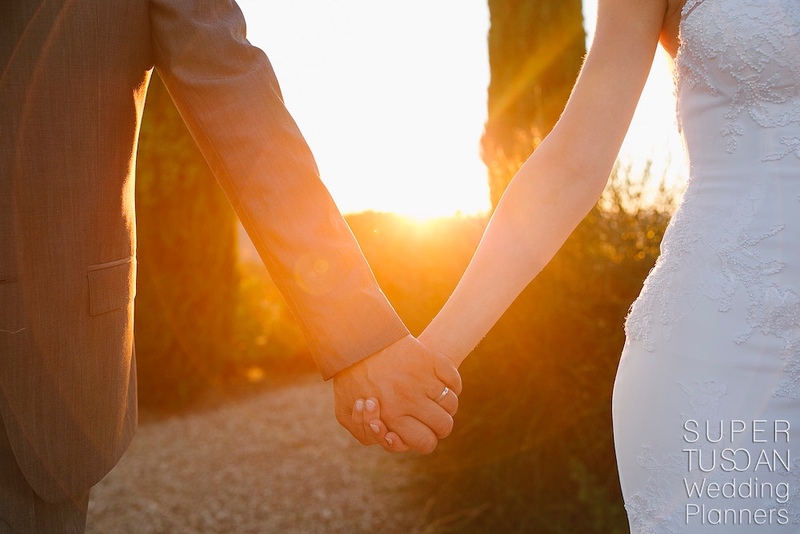 If you love and someone loves you, and you want to tie the knot in Tuscany, contact us! 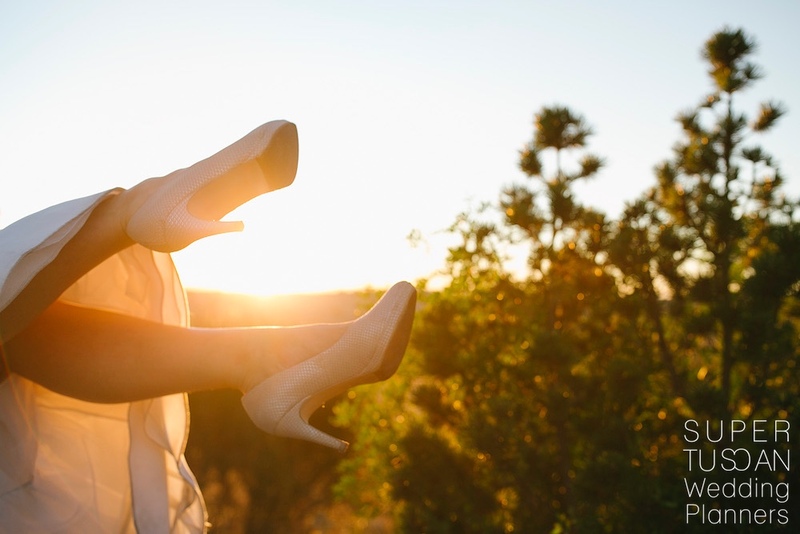 We are willing to help you have your magical Outdoor Tuscan Wedding! « Will you be my Maid of Honor?